Every good truck maker offers its pickups in variety of styles and trim levels. In that way, they can be sure that everyone will find configuration that is perfect for their style. But, regardless of that it just seems that never is enough and almost every new model year brings new special editions. For 2017 model year Chevy might be the one which will surprise its loyal buyers. 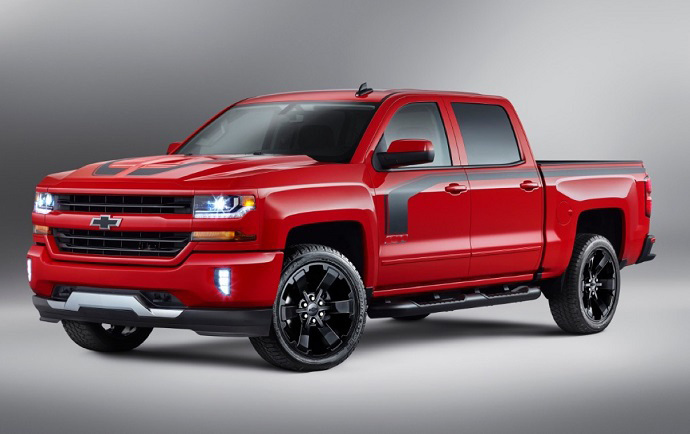 It has been claimed by some reports, that new special edition might be 2017 Chevy Silverado SS. Silverado SS in not a new nameplate in Chevy’s lineup. To remind you, brand had this badge on its popular light-duty Silverado 1500 and it debuted in 2003. It was a high-performance edition of the Silverado 1500. Unique exterior and interior appearance as well as upgraded powertrain stood out this model from the rest of the lineup. The same scenario should be this time as well. So, for the buyers who crave to have a truck that stands out from the crowd, the 2017 Chevy Silverado SS might come as perfect solution (if it turns out to be true). As some reports claim, this model will have the same proportions, overall shape and base design as the standard version of the Silverado 1500. However, this special version will have exterior and interior themed in unique way. The front fascia of this model will feature more aggressive design thanks to more muscular bumper, skied plate, stronger lines and contours. There will also be unique trim accents and badges which will distinguish it from other versions. The model will also get unique 20-inch five-spoke alloy wheels, round assist steps, unique accents on the rear side, etc. Stepping inside we should also expect unique treatment. Leather upholstery with unique stitching will cover seats and dash. More contrasting inserts will also be on door panels, center console, around center stack, and air vents giving stronger impression. There will also be heavily padded front seats with heating and ventilating functionality. Other features that this model should come equipped with are power adjustable front seats, power pedals, heated steering wheel, wireless charging, strong sound system, driver’s information display, etc. It will also include an 8-inch touchcreen MyLink interface with Smartphone compatibility, navigation, voice controls, etc. The safety rig on the model should also cover advanced systems that are available on higher trims. When it comes to the engine and power, the 2017 Chevy Silverado SS should come equipped with the strongest option in Silverado’s current lineup. That means that model should be powered with a 6.2 liter V-8 engine. This engine has capacity to produce 420 hp and torque of 460 pound-feet. Combined with this engine will be an 8-speed automatic transmission system. Both rear- and all-wheel drive should also be available. On the other hand, this model should also get specially tuned suspension and special-ratio steering which will provide unique ride feel. The official confirmation about this version hasn’t come from the company yet. Based on some sources, the 2017 Chevy Silverado SS should arrive short after the standard version of this truck. Suggested price should be in range with upper trim levels which means around $50k.